Ok, so by now you should have an idea of what to expect to hear and see at a bird show, and you've heard the arguments both for and against going to such events. Now lets look at 'show quality' in more detail. Confirmation includes many inherited characteristics such as size, proportion and substance. Because these characteristics can be vital in a captive-breeding program, confirmation is the single most important consideration in judging finches and softbills. 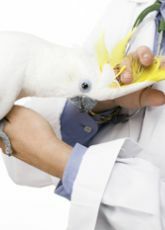 A show bird should be the appropriate size for its kind. Bigger is not necessarily better. Many Waxbills, for example, should be dainty and diminutive in appearance. Size should be within normal parameters for the species or subspecies, not undersized or oversized. All finches and softbills need good substance, the relationship of a bird's musculature and bulk to its bone structure and overall length. Proportion and overall balance are of prime importance, the look of the whole bird outweighing the sum of the individual characteristics. All proportions should be appropriate to the species or sub-species. What does that mean? You need to do a little research about the species you plan to show before you enter him/her in the show. 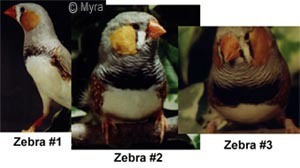 I am going to go over the standards for the Zebra Finch. They are very common at shows, and since I also show them I have taken the time to learn as much as possible about how they show. You must also understand that different judges do have different preferences and ranges on how they judge a bird. The guidelines can be interpreted differently by the individual judge. 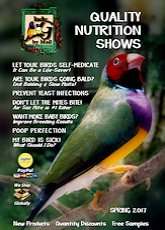 This explains why your bird may do very well in one show but not as well in another. Let's talk size and Conformation. Unfortunately in the Zebra world it has been shown that many judges do prefer a larger more cobby (rounded) bird. This is when it helps to have English and German sized Zebras on the bench. Not all judges give extra credit for size. If they all did, my finches would never win the big ribbons. I don't breed huge cobby zebras. Not that I haven't tried. I have found the larger zebras aren't as active, nor do they breed as well as the smaller Zebras do. I breed for small but nicely colored and proportioned birds which will still offer great enjoyment as a pet in a family household. This photo really isn't the best but it's what I ended up with after a roll of film and three very annoyed males. These show the three sizes of the Zebra. If they would have all sat down and looked in the same direction at the same time their size differences would be more apparent. As the photos show these birds have heads which complement their bodies nicely for the most part. Zebra #2 is a tad larger in the head than he should be. The other two have very nice head - body proportions given their obvious size difference. Wings must be held close to the body. It gives the back a nice smooth and even look. 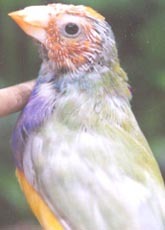 A bird with drooping wings will show a hump at the rump area, especially if the tail hangs low. The wing tips may touch but never cross. When the bird sits with his head up, wings tight and back, with the tail out straight you get a nice angular look to the over all body. The legs should be positioned directly under the body and the bird needs to stand on its own two legs. Sorry, resting your belly on the perch is a big no no. This photo shows you one male Black Breasted Silver Isabel slacking on the job and a Black Breasted Grey Male showing himself with all of his might. Because this photo relates to Deportment & Presentation we're jumping there next. The bird on the right isn't presenting himself well. What can I say, maybe he's had a hard day, or maybe he's just not in the mood for photos. Either way he wouldn't get high marks here. While the male on the left is working hard to show his handsome self. While neither bird is actually show quality you can clearly see how important it is for the bird to be energetic and enthusiastic about the show. It's not good if the bird is upset and fluttering wildly in the cage. Not only does the bird risk ruffling its feathers and coming across poorly but they also risk injuring themselves and no one wants to see any bird at any show get hurt. Keeping finches in show condition at all times is impossible. When they are molting or breeding they are going to lose that excellent condition. They will also lose their show quality luster if they are stressed or malnourished. The condition not only shows that the bird is in top heath but that it is also being cared for properly. Pin feathers and bald spots are also something to watch out for. Trust me, if there is a pin feather to be found on the bird, the judge will find it. 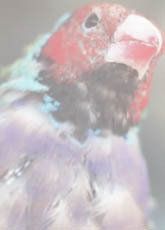 Frayed, worn and/or dull feathers will also count against the bird. I've shown stunning Waxbills, which, if not for the fact I should have caged trained them better, would have done very well. Alas, it was not meant to be. They flutter and panic every time a person walks near and by the time the judge is ready to view them they all have frayed their beautiful tail feathers. This photo of a Black Breasted Zebra Hen shows how even the smallest pin feathers can count against the bird. In Zebras the flaws can be very visible if you know what to look for. The basic here is to have all the colors and markings on the entire body to be correct and as close to what is considered ideal for your species and/or mutation. For simplicity sake I'm going to only going into detail with the Normal Grey Zebra Finch Male. Every Zebra mutation has different standards on their color and markings. The breast markings. Please note these three handsome young males. Zebra #1 has almost no breast markings to speak of. Zebra #2 has a nice black breast bit it's not entirely even and solid. Zebra #3 gets high marks for his breast. He has a bold and solid breast which runs nearly from flank to flank. While I have all three boys here I'd also like to point out a few more things. The black tear mark that is in front of the cheeks. Do you see the flaw in Zebra #2s tear marks? They are barely visible. He won�t get many points for that. Now Zebra #3 has very nice tear marks but Zebra #1 has even better ones. His are solid and run the entire length of the cheek where as #3s cut off a little short. Their beaks are not all the same. Zebra #2 has a good colored beak but he's also an older bird and his beak is in need of a little maintenance. A nice stick to scratch it on helps but his age is the main factor in this case. Zebra #3 has a some what better beak as far as the over growth goes but it's not as deep of a red color. Zebra #1 on the other hand is very young and in the prime of his life. His beak is perfect. Everybody turn to your side..
Flanks are very important when showing Zebras. Various mutations may have different colors and styles of flanks but they are still important. The three boys I have chosen here have noticeably different flank markings. Zebra #1 where are your flanks? Maybe if he opened wing you'd see them but I doubt you'd see much more than what you can see now. Zebra #2 has nice full flanks but what you can't see well in this photo is that they are a tad too fluffy and not flush with the body as they should be. Now my boy #3 has top grade flanks. Full, bright, and run the length of his body. I'm going to jump from the Normal Grey for a brief moment here. When showing Black Cheek Zebras I personally would want to see the Black and White flanks to compliment the cheeks. More commonly found is the brown color you see here but black flanks are what you should strive for. The underbelly on most mutations of Zebras should also be as white as possible. Creamy to fawn colored is permitted for some mutations. On to the tail. The main tail feathers should be the same color as the back of the body. On top the tail feathers is found the upper tail coverts. These are important in Zebras. They should show the typical black and white stripes. The black area will actually be different colors in the various mutations. No matter what the mutation the coverts should be there in some fashion. White Zebras will of course not have black coloring anywhere on the body. In the photos notice the one on the left has a wonderful array of tail feathers and the coverts, while the one on the right is lacking the black and white feathers. Spring and Summer are just around the corner. The show season is starting. Have fun, maybe I'll see you at one of them!